How do I communicate with people coming to my Facebook event? This article follows on from How Do I Create A Facebook Event? and you should read that one first if you’re starting out on the process. Today we’re talking about how to communicate to the guests who are attending your Facebook event. How can I get in touch with people attending my Facebook event? There are two ways to do this: add a post to the event, or message attendees. 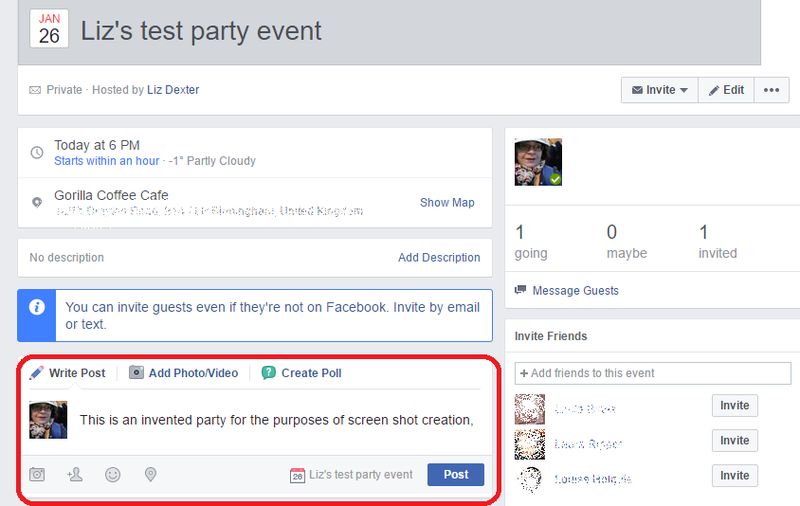 Once you’ve created an event, when you go into the event page, you will find that it looks quite like a normal Facebook newsfeed. On the left-hand side, you will find an option to Write Post / Add Photo/Video or Create Poll (you can create a poll to find out people’s music or food preferences, for example). 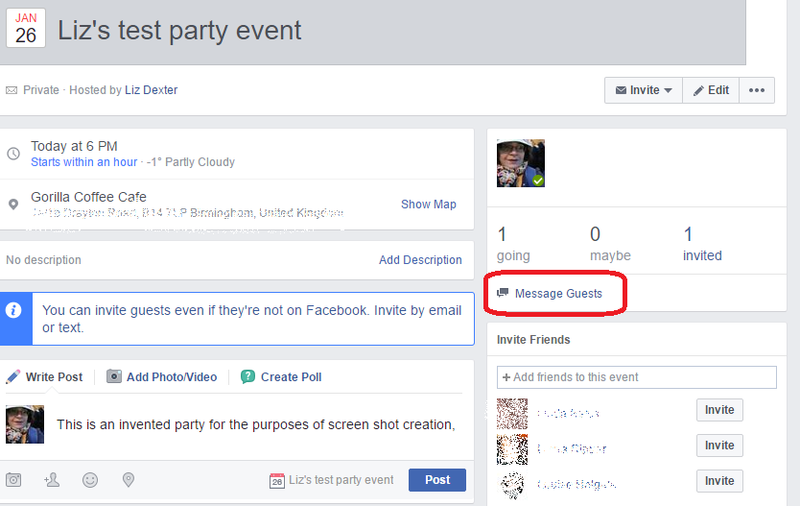 Type your message into the text box and hit Post and your message will be visible on the event page. You can use the drop-down arrow that appears in the top right to “pin” your post to the top of the event newsfeed if it’s important. Who will see this message? Anyone who visits the event page and people whose notification settings are set to send them posts in events they’re attending. Where will you see replies? Anyone can reply to your post and all comments will be visible to everyone who is invited to a private event or who looks at a public event. There is also an option to send a Facebook Message to your guests. When you click on the link, you have the option to select the group of people who are going, those who have replied maybe and those you have invited but who haven’t responded. So this is a good way to remind people to reply, as well as to send messages onto to those people who are attending. Write your message at the bottom of the screen, tick Send as group message and press Send, just like you would when using a standard Facebook Message. Who will see this message? Only the people in the particular group you’ve selected, so it’s useful if you want to tell people something without telling the whole world, or chivvy along invitees who haven’t yet responded. Where will you see replies? Replies will appear in the Facebook Messenger session that you’ve set up by doing this. This article has explained how to get in touch with people attending your Facebook event. Here is a great post from the Libro Editing blog on how to communicate with attendees for your Facebook event. Check out these great tips on how to engage with people who attend you Facebook event from Libro Editing. Liz Dexter from libroediting.com provided us with an extraordinary article on how to communicate with people coming to my facebook event. What a gem. Thank you, Liz! I do not see Message Guests as an option anymore. The screen looks different now. Was the Message Guest feature removed? 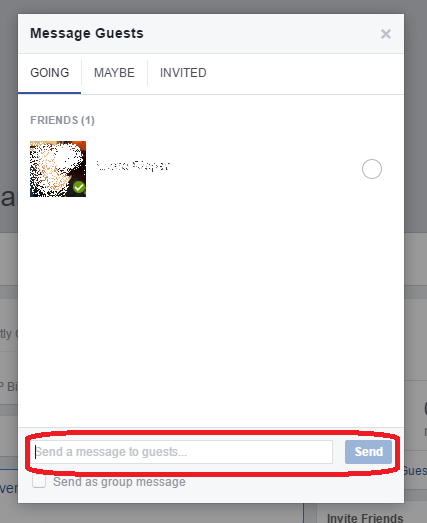 If you look in the About tab of your event, there is a “make plans on Messenger” area where you can enter people’s names and message them, so pretty much the same.